I don’t believe in ghosts. Or really, to be more to the point, I want to believe in ghosts. There just isn’t enough evidence out there and the folks that generally hunt them are little more than a bunch of people with night vision cameras wandering around in the dark. I think it would be pretty awesome if ghosts were a real thing, but there’s very little to them except for the stories. 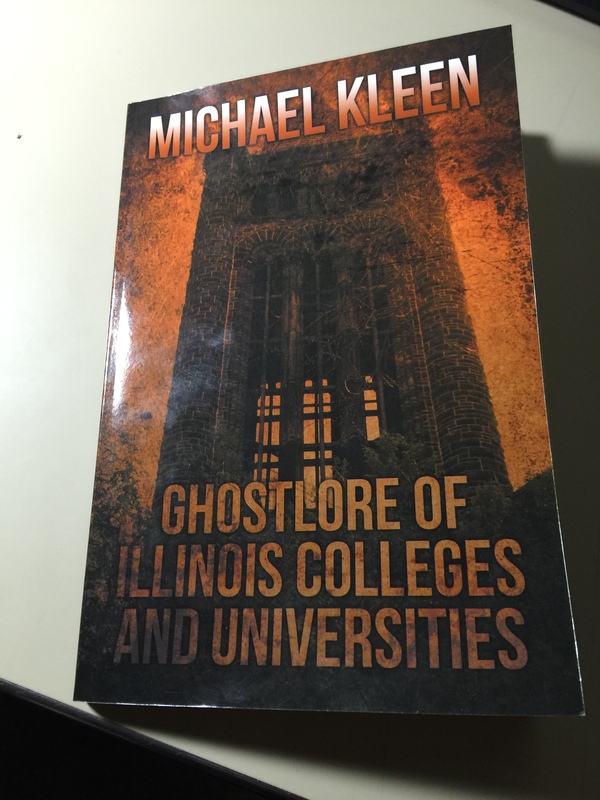 And it’s at this point that I find myself on the same page is Michael Kleen’s book, Ghostlore of Illinois Colleges and Universities. He doesn’t want to convince me that genuine ghosts haunt the various Illinois universities. Instead, this book would rather discuss the stories that are being told and examine the history that inspired them. It’s the combination of history and legend that makes the stories that are told interesting. This book focuses on Illinois campuses specifically, so everything begins with the location. The surface level is the story itself. The legend. What people say happened there. Beneath that is the truth, but much like the story itself the truth is fragmented. Partially documented history only tells so much. The strongest part of the book is the history that it manages to document. It’s interesting to learn about the history of the universities themselves, unrelated to the ghost story that emerged from it. It’s even more fascinating tracking a story from its roots to the glorious legend it is today. My only real issue is that the book spends a lot of time trying to convince me that the telling of ghost stories is something that college kids do. It binds them together in a collective experience. Now, I was more or less a hermit in college. Some days went by without be speaking to an individual person. Also, the school I went to did not have a famous cemetery nearby. There was no sanitarium down the road. Both NIU and NEIU are old places, NIU being around since 1895 and NEIU since 1867. The problem that is brought about by spending so much time explaining the importance of what the stories mean is that this takes a relatively short book and limits the amount of ghost lore discussed. Over a third of the book is spent explaining what ghost lore is and then providing examples for where ghost stories tend to occur. This then means that many ghost stories are told twice. Three times in regards to a girl who, while on a tour, smelled lilac. It’s not so much an issue when discussing Mary of Pemberton Hall, or Ange the librarian, but it does make for some sore repetition when there’s not much more to say about the story, like the aforementioned lilac smeller. While I may question the importance of these stories, along with how important they are to the students that attend the universities, I can’t help but find myself attracted to the history of it. I don’t usually read nonfiction, so it’s hard for me to wager if this is excellent nonfiction or not. I did find it to be an interesting read, so if you’d like to know more about ghost stories this is definitely not a bad place to look. Ghost stories make for an interesting way for people to explore any sort of fascination with death. They provide anonymity and distance that traditional death generally does not provide. At the age of 33 several people I’ve known have died. Some younger than me. A few of these people I’d even argue could have done better than me, had they had the chance. But with them I can’t separate their life from their death. I hold who they were too close to the heart. A ghost story though offers distance, and not just personal distance. Most ghost stories are based on events that may or may not have happened a long time ago. It allows stories of death to be told, unbiased by personal history, without concern for who the people really were.